maybe A is communing with Ceiling Cat. Those little cat feet... one never knows when the drink cart has been tampered with. Tsk, tsk. She wears it well however and the sight of her brings happiness to this reader. Good wishes with your work and we long for your words out here again! Welcome home, Tobias, and good luck with the plumbing problems. Thanks for this great photo of the Queen. She is truly regal. Tobias, I pray that you did not tamper with the drinks trolley at the conferences. Is it possible that instead of being busy with parish calls and plumbing problems, you are sleeping off the effects of that tampering? Say it isn't so. My last two cats were Lynx-point siamese; HRH Juliana & HRH Juliana II. Juliana was a gift as a kitten. At 2.5 years she ran out an open window without a screen the first night in a new apartment five years ago, never to return. Juliana II was an abandoned kitten found in the front garden of the law firm next door to my current apartment. After a little over two years this small apartment could not contain her spirit, so she was given to a family with little girls and a very big house near to the home of my land lord. I so want to get another! Thanks for the welcome back. The conference was exhausting, and no, Grandmère, I was practically an abstainer during its course, allowing myself only one-half glass of wine on one of the evenings. This, in spite of the presence of at least three people from Louisiana. We did share a number of Boudreaux stories, however. David, Augusta was also taken in from exile. Oxford Deodatus (pictured elsewhere on the blog) had gone to his reward after a short but difficult illness. 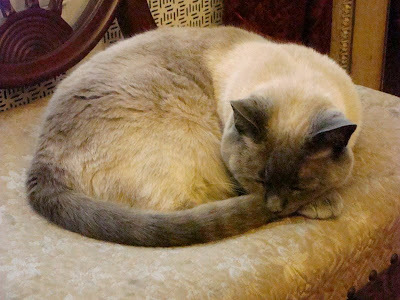 We were in the market for a replacement, and had even contemplated purchase (a rarity, as all other felines of the household had been divinely ordered to our possession) and were set on a Russian Blue from a cattery up the way. God intervened once again, however. Augusta appeared at my basement door one day during the laundry, as I heard a tiny peeping sound. On opening the door I found a tiny kitten, much battered and bleeding from nose and eyes. Obviously a failed assassination attempt by Anarchists of some sort. In any case, she was rescued and, as is the wont of the species, took over the household.